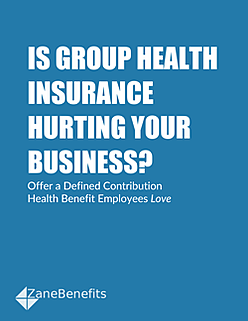 New eBook - Is Group Health Insurance Hurting Your Business? Zane Benefits, the leader in individual health insurance reimbursement for small businesses, announced today the publication of a new eBook: “Is Group Health Insurance Hurting Your Business?” The eBooks provides a step-by-step guide, including a detailed timeline, that will help small and medium sized businesses offer employees affordable health benefits by transitioning to a defined contribution health plan. According to Zane Benefits, for businesses to thrive in today’s economy, finding and retaining the best employees is a top priority. In the past, group health insurance helped accomplish this as it was the best way to offer competitive health benefits. But continual increases in healthcare costs have made offering traditional group health insurance untenable. Smaller businesses have been particularly challenged and are canceling group plans because they have become too expensive. In addition, employees can purchase better and less expensive coverage on the individual health insurance market. This does not mean businesses have stopped providing health benefits. Instead, businesses are looking for new ways to offer affordable coverage and are adopting a defined contribution health plan. The eBook is written for small and medium sized business owners, health insurance professionals, and brokers and covers how to transition from a group health insurance to a defined contribution health plan, such as ZaneHealth.